One of the beauties of Paris is that it's a "walking city." To tourists, that means it's much easier to take in the sights. 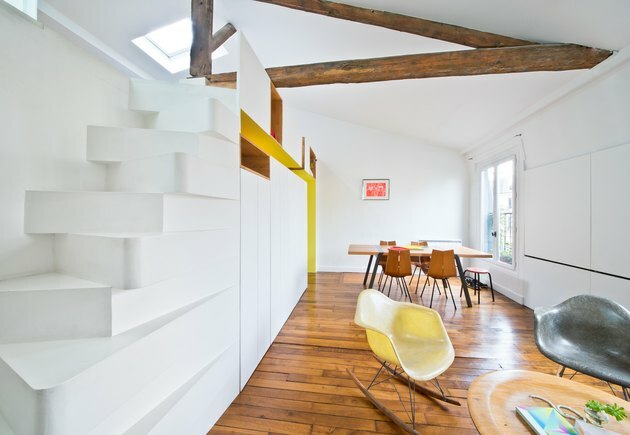 But to residents, it's something a bit different — especially if you live in one of Paris's hilly neighborhoods. 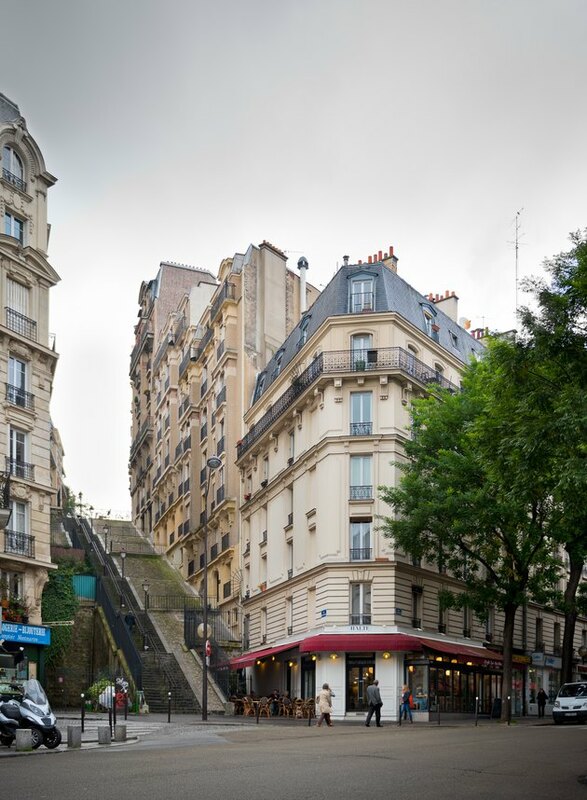 "Living in Montmartre requires a physical commitment that not everybody is willing to make," explains Alex Delaunay, founder of architecture and design firm Sabo Project. So when his company was tasked with carving out a new interior for a seventh-floor walk-up in the city's notoriously steep district where streets are sometimes connected by long staircases, he understood that the place had to be something really special: "Getting to this home in particular can sometimes feel like an achievement in itself," Delaunay half-joked. The living room showcases classic Eames pieces, from the coffee table to the iconic molded fiberglass rocking chair. 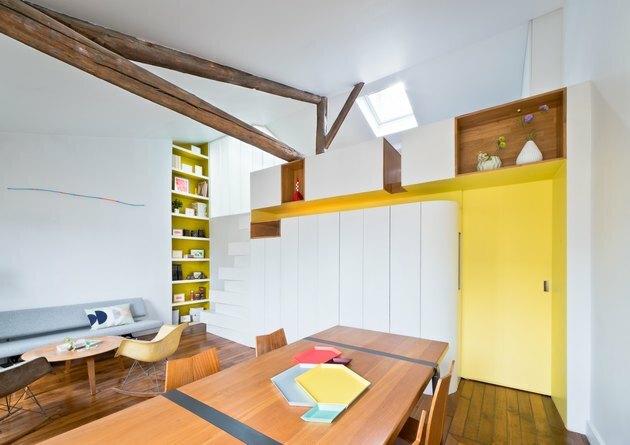 Pops of bright color behind built-ins help to frame the space. While the unique staircase leading to the mezzanine isn't something we'd attempt after a few glasses of wine, we admit: The alternating, Jenga-like steps make the space feel modern and almost sculptural. The open living-dining area feels like a tribute to the great midcentury furniture designers: Aside from the Eames pieces, there's a 1950s era sofa by Martin Visser and dining chairs are by Swiss maker Hans Bellmann. The cute pillow on the couch is from Scandinavian brand Ferm Living. 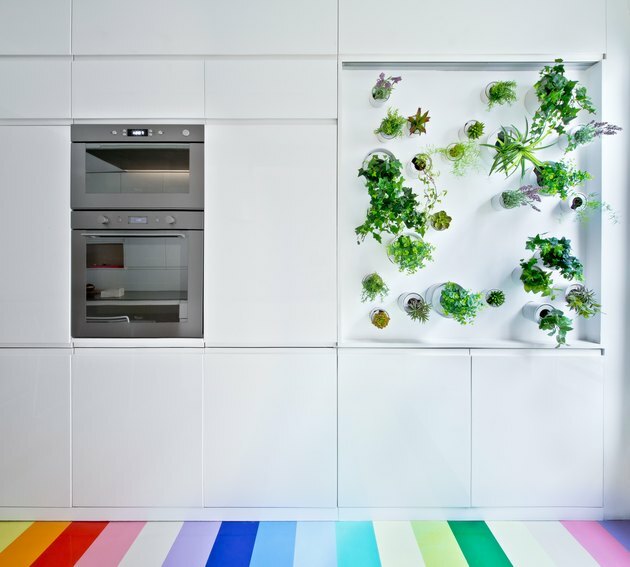 In the kitchen, a vertical garden — which grows via both natural and artificial light — offers color against the stark-white walls (as well as delicious fresh herbs). 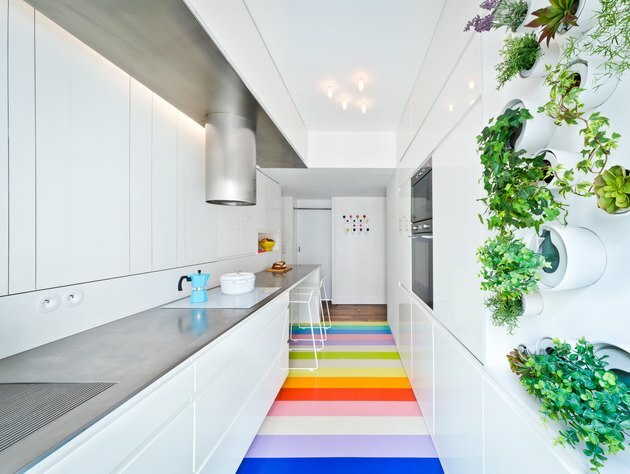 The rainbow-like rubber floor strips elongate the rectangular kitchen. "The owner deals with color swatches on a daily basis and was immediately on board with the idea," said Delauney. The kitchen was all about creating a surprising contrast. "The idea," explained Delaunay, "is to put in relationship the simple aesthetic of [a] highly functional kitchen with the brash colors of the flooring." Aside from the usual challenges that come with a century-plus old space (dark corners, unnecessary walls), the firm needed to figure out ways to make the apartment more functional. 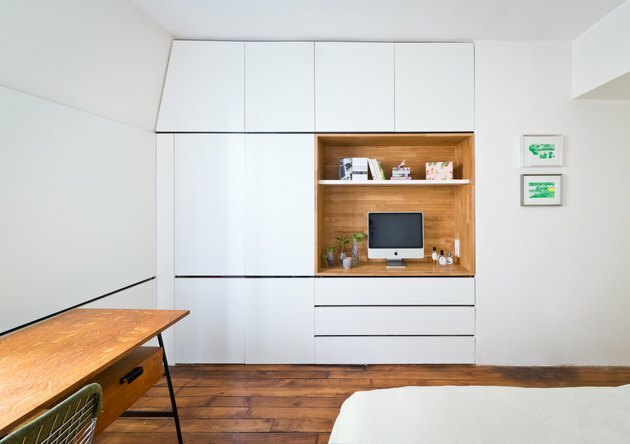 This included creating built-ins that didn't add bulk. 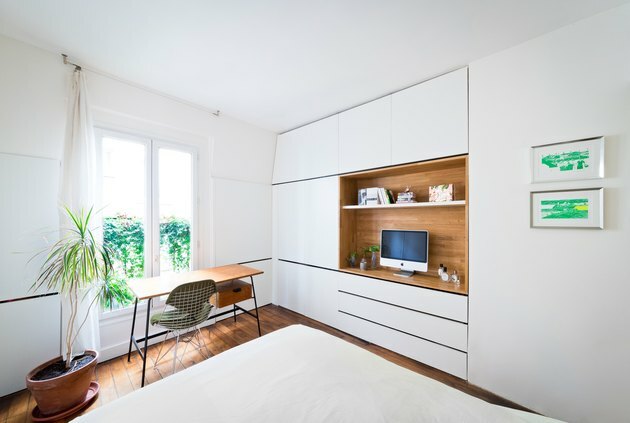 A vintage desk by the Parisian modernist furniture designer Pierre Paulin offers a simple workspace in the bedroom. The green artwork is by Astrid de l'Aulnoit (whose work is also featured in the living room area).